Well, the afternoon started off well and for once things got better as time passed. We started off with the adoption of Belsan. Some of you may know of him, as he was featured in a recent edition of the Sunday Mail colour supplement. 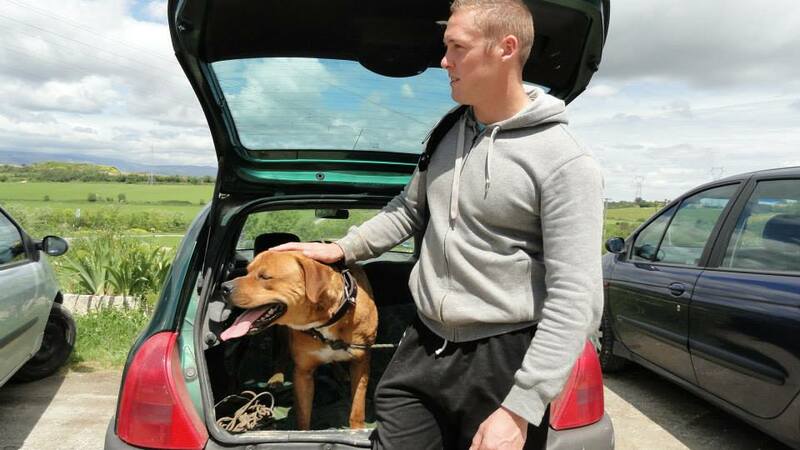 His owners had gone back to live in the UK, leaving their poor dog alone in their house. 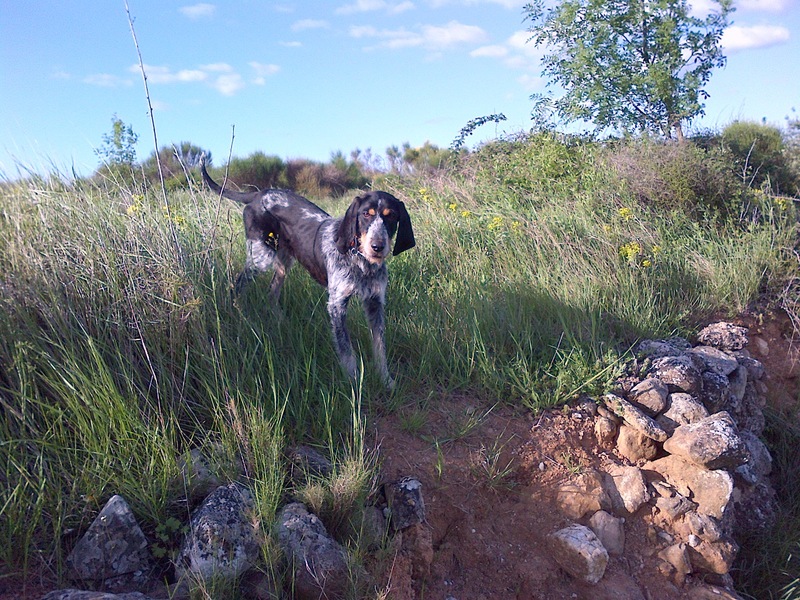 Belsan was not lucky at the refuge, and has spent most of his three years with us. However he has finally found an adopter who is not put off by this boy’s size! On the other end of the scale, size-wise, we said goodbye to Ilana, the tiny puppy who was dumped at the refuge and taken into foster care, as written about in an earlier post. Melanie will miss her, but that is how fostering works…..
Then Jiro, our ten year old Australian shepherd, was reclaimed by his owner. Her mother had just died and she had lost herself in grief for a week or so, which is understandable. Next it was the turn of Sveltesse to leave officially. 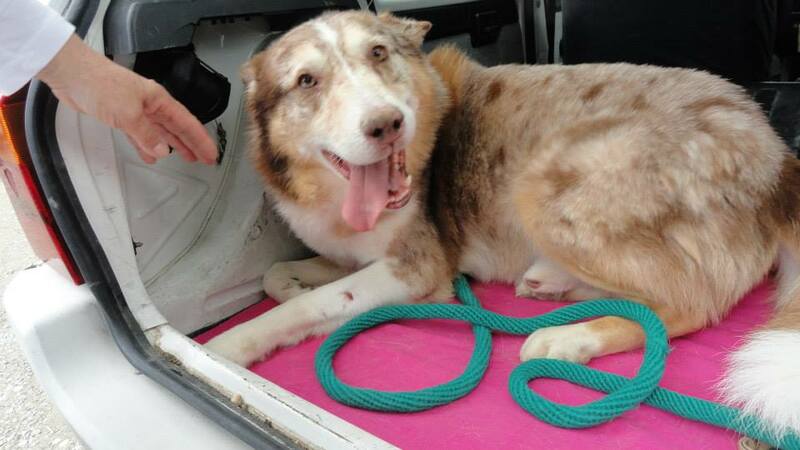 She had been with a foster family for a week, but today papers were signed and “Tess” as she is now called, left the refuge for the final time. I don’t blame her for not wanting to get out of the car! This girl knows that she has landed on her paws with the lovely Mary. And finally we said goodbye to Basil, who has been renamed “Idefix” by his new family. Today was officially a GOOD DAY! 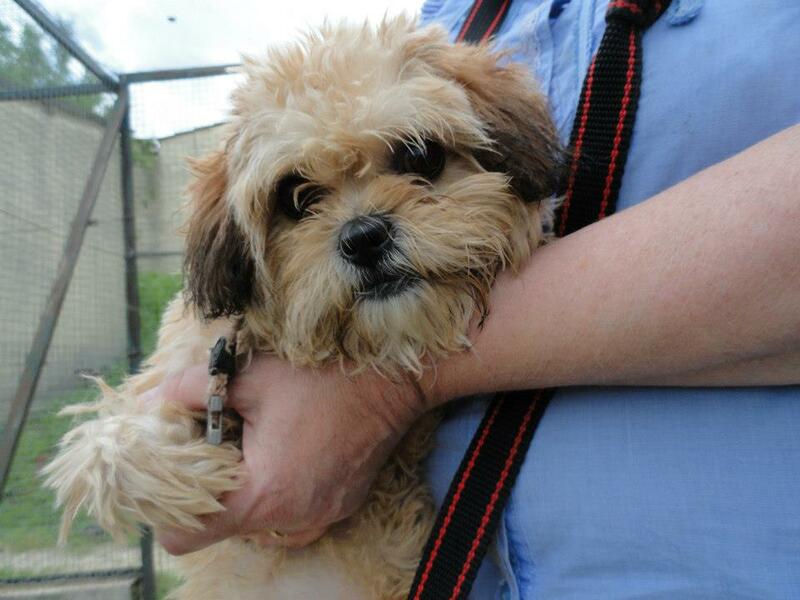 Then leaves with his new owner, after a final look towards his kennel. And Idefix (Basil) leaves with his new family. With the horrible weather back again there has not been much going on at the refuge. However much of the work is done behind the scenes, and plenty has been happening via the internet. Questions have been answered, photographs sent, advice given and websites updated. Whilst updating my site today (or rather sending my update to my web elf who will do the difficult bit), I realised that I had forgotten to tell you about a recent adoption. The reason I forgot is that once again this was done out of refuge time. On Monday morning the family who had been looking after Snoopy brought him to Carcassonne. 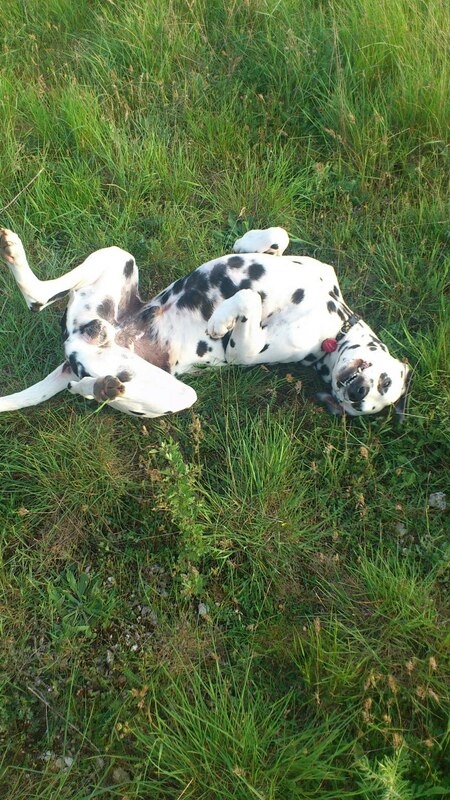 You remember Snoopy, the dalmatian whose owner is dying of cancer, and who was featured on this blog a couple of weeks ago. A SPA volunteer showed up too, in case there were any language problems, but to be honest one look at at Snoopy and it was a done deal. 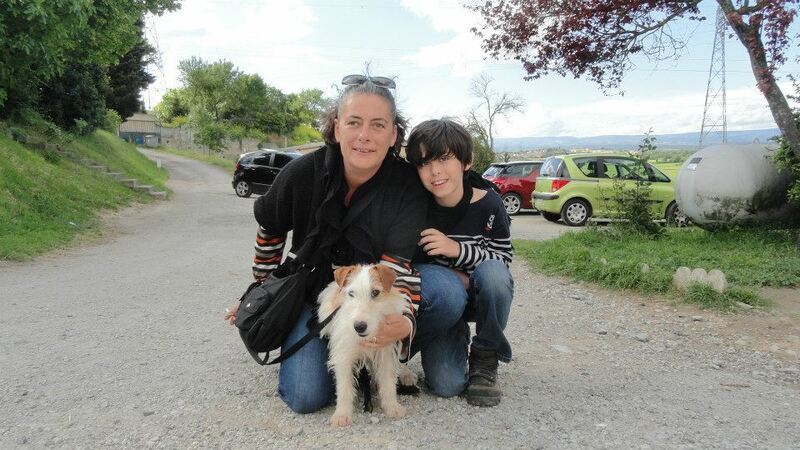 The adopter had come from Toulouse, and brought two friends along for their opinion, but after minimal discussion it was off to the refuge to fill out the contract and Snoopy went to his new home. Thanks to all those involved in Monday’s adoption of Snoopy and thanks to all the other foster families who help their charges on their way! No prizes for guessing that these two puppies who arrived on the same day are not related! But I always say that the SPA has a dog for everyone. We have big and small, young and old, male and female, lively and calm. Whatever you are looking for in a dog, we will find the right match. Perhaps one of these two new arrivals will steal your heart! Bit of chalk and cheese, but each to his own! 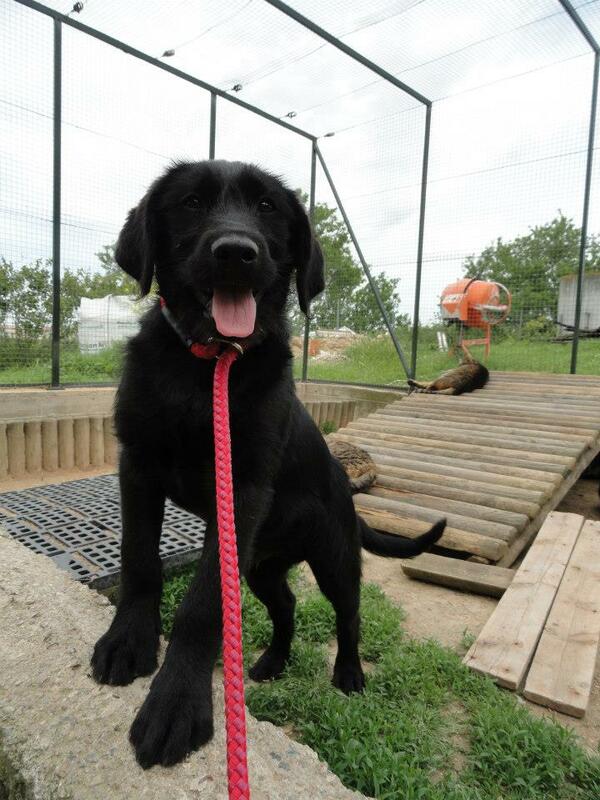 Firstly we have Pluto, a black lab cross just 10 weeks old and already homeless. Pluto has medium long fur, and is a typical puppy; very playful in short bursts, but very happy to be held in your arms, when he calms right down. Then on the other end of the scale we have Minnie. She is a Shih Tzu who was born in mid January. She will appeal to you if you like small and fluffy dogs. Both of them are living in the cat house and so are cat friendly (although as pups you would expect that). They both have a 10 day legal delay in case their owners come to find them,but I wouldn’t hold your breath. No panicky phone calls so far, which means that both dogs will probably be better off with new owners. If you would like to visit either of these dogs, please get in touch via my website http://www.dogrescuecarcassonne.co.uk/ or the SPA Facebook page www.facebook.com/SPA.CARCASSONNE, links to both are on the right of this page. 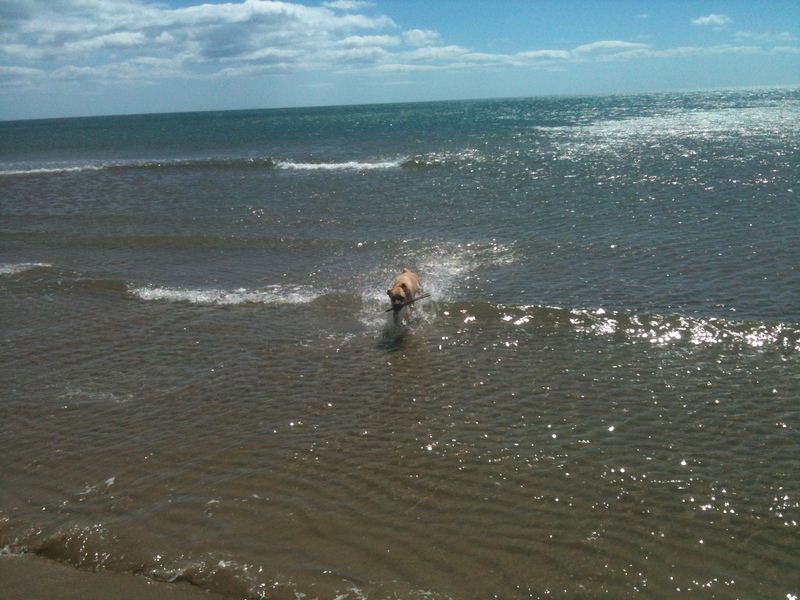 Happy days for happy dogs! One of our tiniest girls was adopted today, but she was reserved so quickly after her arrival that I didn’t even bother to take photos of her! Her adopters have been to see and walk her almost every day, so Isis, as she is now called, was delighted not to be put back in her kennel after their visit today! Happy life little one! It is always excellent to receive news and photos of our dogs once they are happily homed, so today I would like to show you photos of Lily Blue, who featured in this blog on the day of her adoption almost 2 weeks ago. She is looking wonderful, isn’t she? And I also received some lovely photos of Beccasine, now Becca, who left us over two months ago. As you can see, she is loving her new freedom and has proved to be as well behaved out of the refuge as she was when she was with us. I also want to draw your attention to an article written by one of our volunteers. Maybe this will inspire more of you to join our team of volunteers! Thanks Moira! As you can imagine, most of the “action” takes place at the SPA. However sometimes it is nice for the dogs to get out and about and see a little bit more of the world. The volunteers do take the dogs for walks, clearly, but these tend to start and end at the refuge gates, and follow a route that is familiar to the dogs. Sometimes, however, a couple of lucky dogs get the chance to go out for an away day! Yesterday Pollux and Cleopatra, both of whom had been washed recently, went out for a long walk around a nearby lake with two volunteers. Of course it is difficult for them to be put back in their box (which they share) after such a lovely day out, but I bet they both slept well! Here they are on their photo shoot. 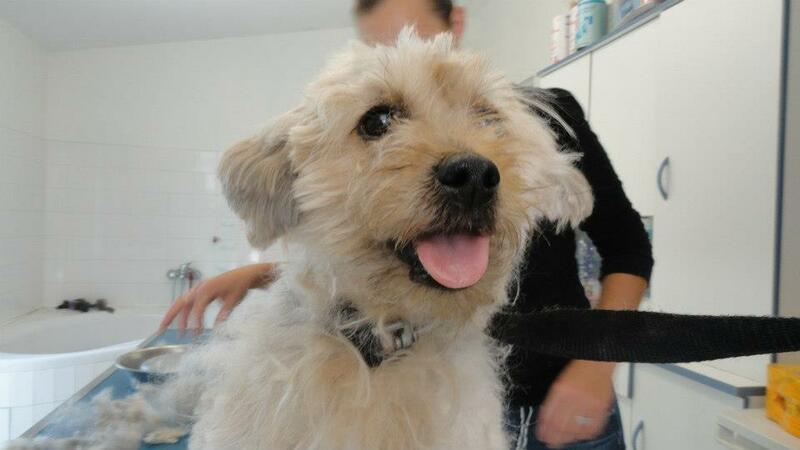 Pollux is a lovely hairy griffon of just a year old, fine with both males and females, and Cleopatra, despite her grey hair, is not even a year old yet, and is a tiny timid griffon cross who is just adorable, especially with young children. Come and meet them at the SPA; maybe you will fall in love with one (or both) of them, and walks such as the one they had yesterday will be the norm! Bobby leaves his foster family! During last Sundays Spring Fayre a couple decided to offer a temporary home to little Bobby, a bichon who had arrived with terribly matted fur, and who really needed some more grooming and TLC. Both are available at the refuge, but with 130 dogs to look after, nothing compares to a real home! However Bobby’s photos were seen on Facebook, and the foster family did what every foster family should; they arranged to meet up with a potential adopter, and with minimal involvement from us, the deal was struck. Bobby arrived back at the refuge today in time to be micro-chipped, and his new owners came along to collect him straight away. 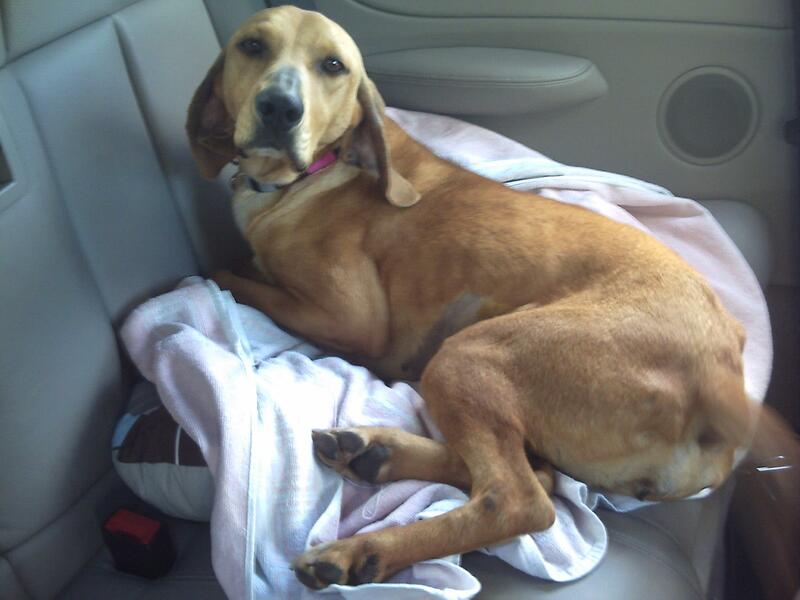 He is going to have a wonderful new life and many thanks to the foster family who helped him on his way. The new adopter is going to join our team of volunteers, so that is great news for the refuge too! In terms of numbers, his place was taken by a somewhat larger dog. 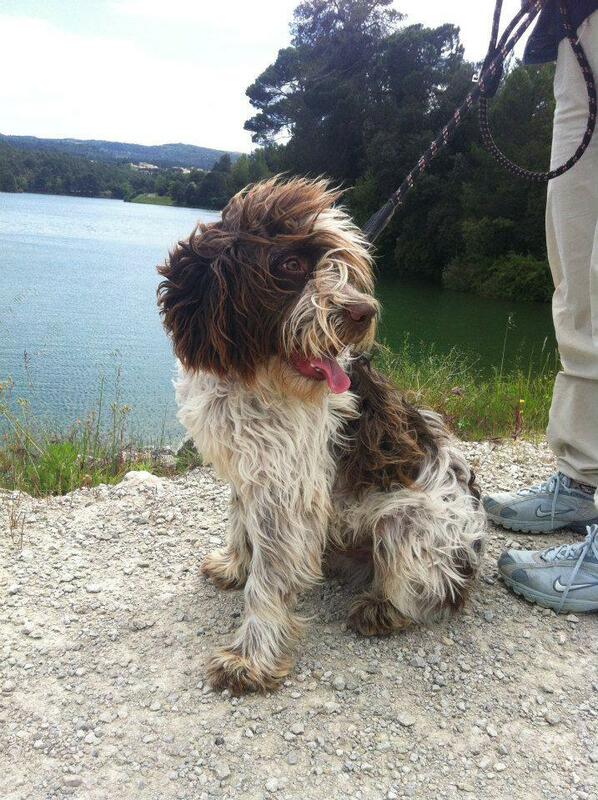 This is Rocky (or Rocky 2, as he will be known at the refuge, we already have the first in the series). 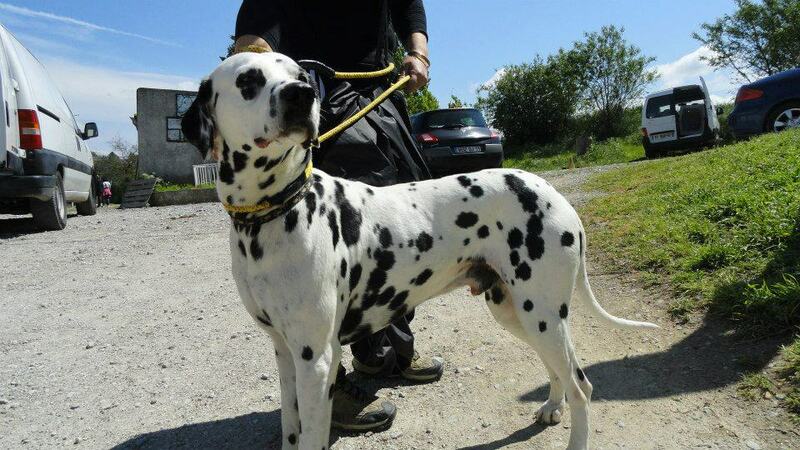 He has been abandoned as his owner has a 7 month old baby. Oh, does he not like the baby? we asked. No, he is perfect, was the answer. Hmmm. Can’t be financial, cos they were all smoking and had a smart car and very nice (possibly fake) designer clothes. Hey ho. Rocky 2 is nine months old. 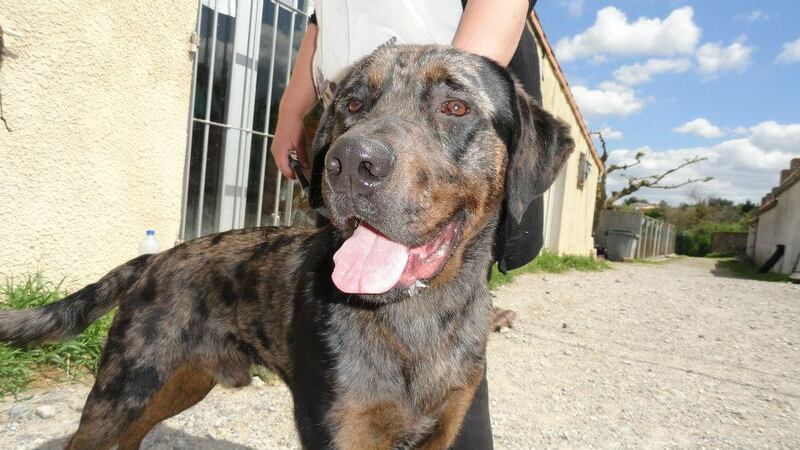 He is a beautiful (and HUGE) harlequin beauceron, who is fine with children (yes, and babies), and cats, and dogs. He is already sharing his box with another male. All in all the perfect dog, but rejected for a reason I will never understand. 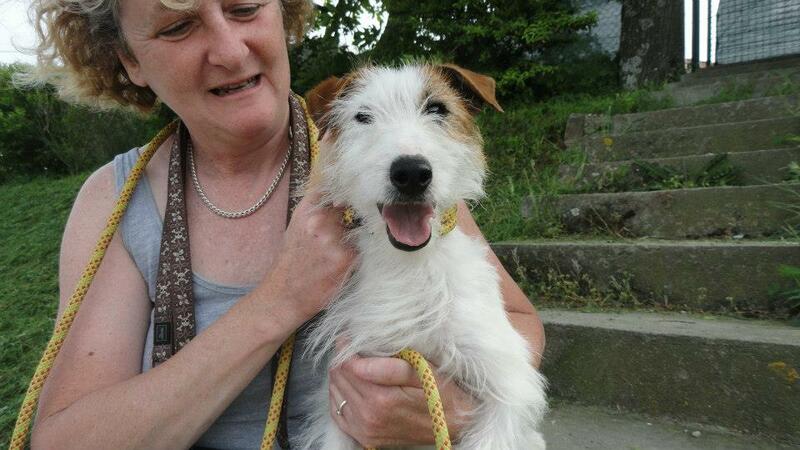 Let’s hope he finds a home as quickly as little Bobby did! Rocky 2: Harder to home, but just as deserving! Two fabulous adoptions and a fostering. Well, here’s something that doesn’t happen nearly often enough! A lovely man came to the refuge to look for a very particular dog. 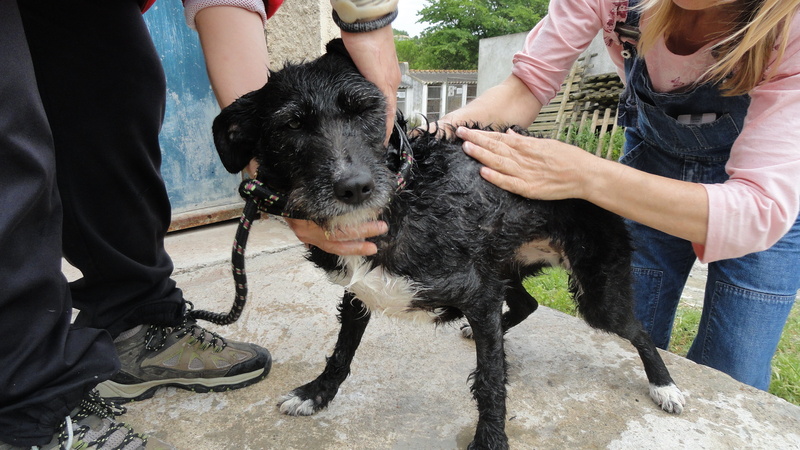 Kiko had been abandoned at the SPA three weeks ago by this gentleman’s neighbour (usual story, border collie, too active/intelligent for its owner). 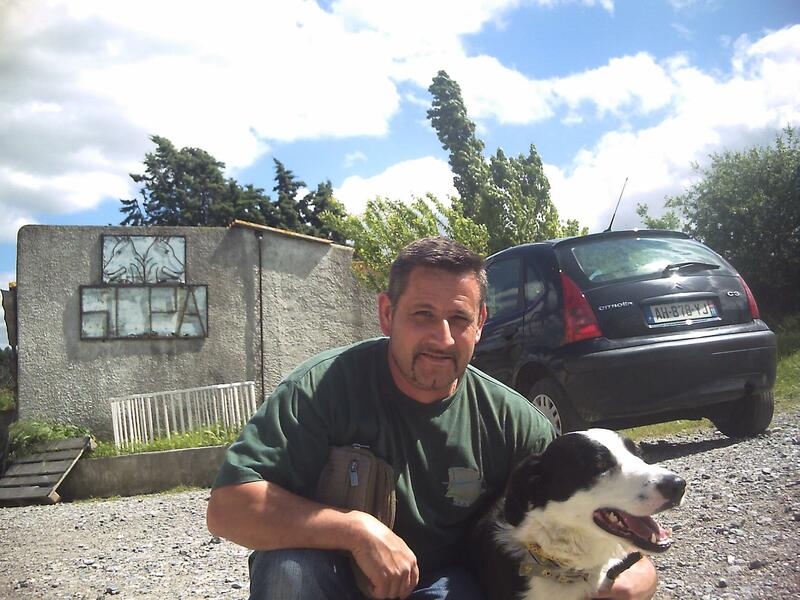 However Kiko had been a good pal to this man’t children, and when he found out that this beautiful dog had been dumped at the SPA, he came to adopt him. So his children have their playmate back, and Kiko has the home that he probably always wanted! Another departure today was that of Bonn, who caught the eye of a family who were not put off by her long ears. In fact they, like our good friends at Animal Trust, are Belgian, so do not have the French anti-chasse dog prejudice and are more inclined to go on the character of the dog. And Bonn is a gem of a dog. 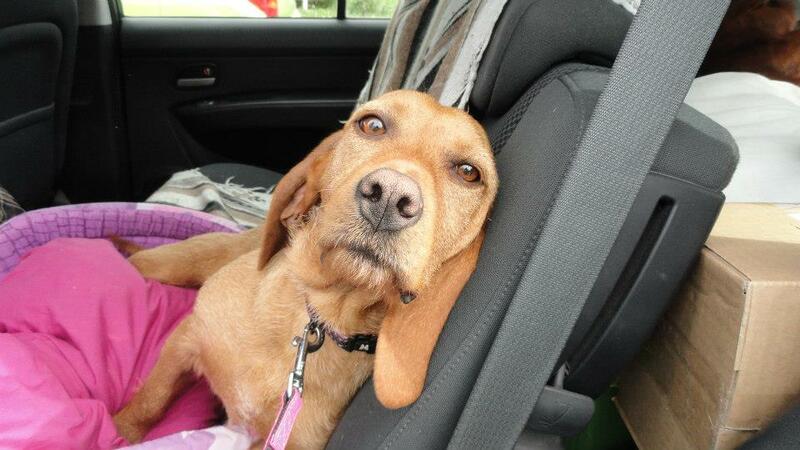 On the subject of long ears, my golden girl, Sveltesse has gone to a foster home that we hope will become permanent. And there is another reservation, but I will save news of that for another day! Don’t want too much good news all at once! 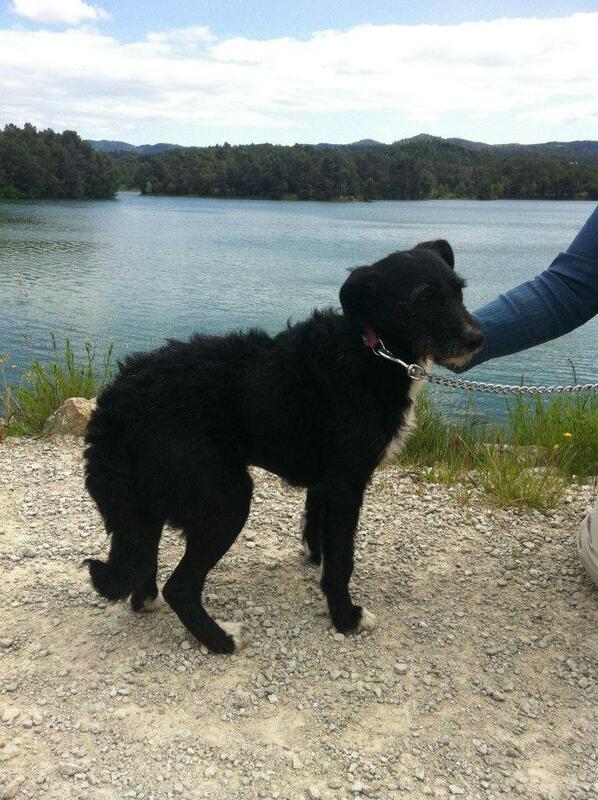 Kiko: back to the old neighbourhood with an owner who loves him! Working Afternoon in the Sunshine. The refuge was shut for the second of two bank holidays, but the volunteers were having none of it! We miss our dogs too much, and the thought of them spending another afternoon alone, apart from a quick flit in to feed the thinnest dogs, was just not acceptable. The sun was shining, so a few of us volunteers and three volunteer/employees agreed to meet. We had a lovely time doing all the things that we quite often don’t get the chance to do, due to ringing telephones, dogs being brought in etc. 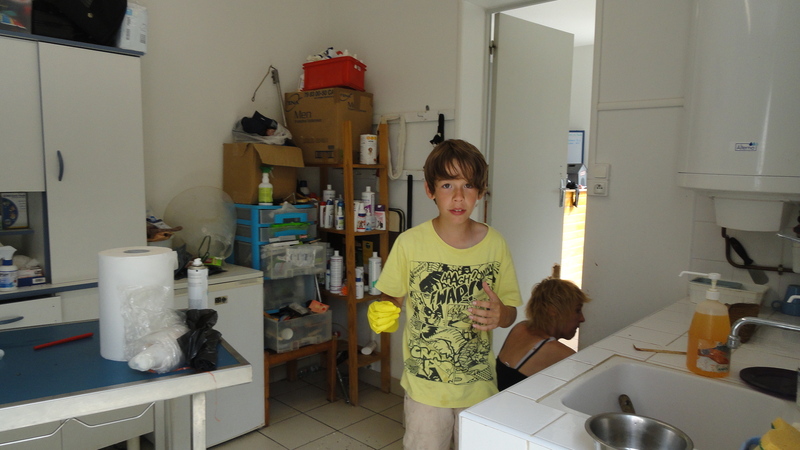 We washed some dogs, we played with some of them in the park, we cleaned out the infirmary, we changed the kennels of some of the dogs to give them a change of scenery. It was a really lovely afternoon, and we even had cake, which can’t be a bad thing. Here are some of the photos: I know some of this looks like child labour, but I promise they were all willing participants! After I had uploaded my blog last night I thought I would be able to relax for an hour or so before going to bed. Then the phone rang. It was the SPA guardian, calling to tell me that a very young puppy had just been put into one of the external kennels. Could I find someone to take her, please, as her eyes were only just open, and she was way too young to be away from her mother, let alone survive in the refuge. A quick post on my Facebook wall and one in a private group of fellow-volunteers brought several offers, and now Ilana is safe with one of the volunteers. Thanks to those of you who offered to take her in, I will bear you in mind for next time. And yes, that is a threat/promise! I have to say, people never cease to amaze me. Apart from minimal manning in the mornings to clean out and feed the dogs and cats, the refuge is shut both today and tomorrow. It was a miracle that the pup was found in time. I know whoever dumped this puppy is not reading this blog, so there is little point in venting my spleen. But I have to say that whoever it was is an extremely sick individual. 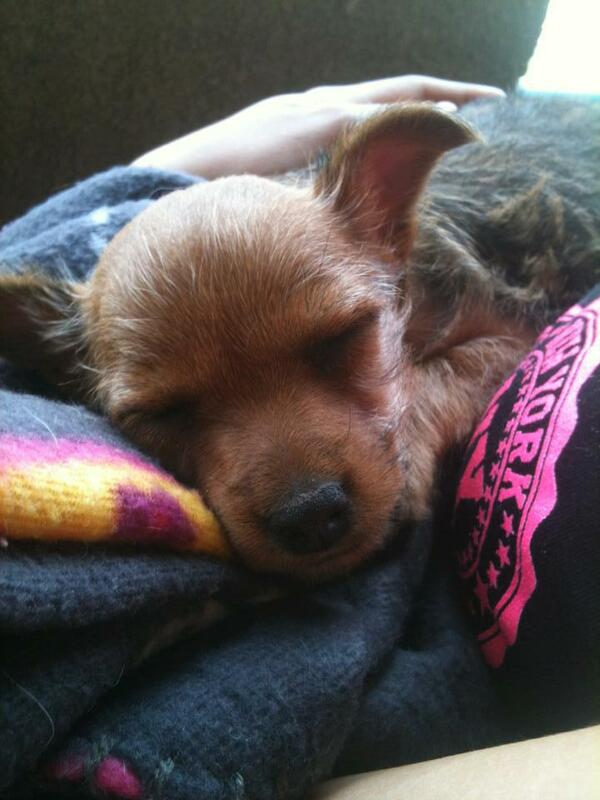 Here is little Ilana, curled up asleep on her foster mummy’s lap. She is a very lucky girl. 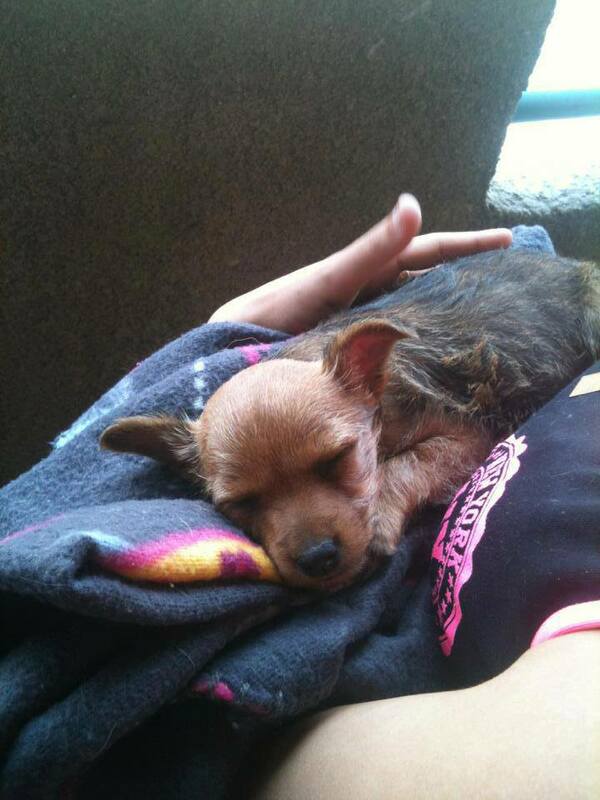 Ilana is going to be a very small dog, a yorkie or a pinscher type, we think, and in due course will be up for adoption. So if you are reading this, perhaps her story will touch you and you will offer her a home when she is old enough! A foxy new arrival and a new look on Twitter! Hey, you didn’t really expect there to be any adoptions today, did you? Not when there are two days of bank holidays approaching and of course most people will take Friday off, thus having 5 days free. So inevitably the movement was inwards, rather than outwards. Some of the owners of the 4 new dogs may well come back to get them and be happy to have had some bargain-basement kenneling. Most of them won’t bother. One little guy who will be easy to home is Basil, seen below with one of our volunteers who met him for the first time today and was tempted to take him home! What a lovely looking chap! If he has owners, best they hurry up and reclaim Basil, because he won’t stay long after his 10 days “pound delay” is over. Something very good did happen today….For those of you who follow us on Twitter, we have a whole new look. No, not down to me! Whereas I am not a complete Luddite, I do not Tweet. However this morning I was contacted by a webmaster who had noticed that we have lots of followers (perhaps including you), but not many tweets. This is because our usual twitterer has been very busy, and was more than happy to have a helping hand! Follow us, if you don’t do so already. And if you have any time to spare and skills you would like to offer, don’t hesitate to get in touch!